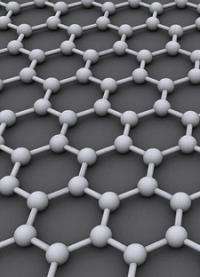 The method involves growing semiconductor-nanowires on graphene. To achieve this, researchers "bomb" the graphene surface with gallium atoms and arsenic molecules, thereby creating a network of minute nanowires. "Given that it's possible to make semiconductors out of graphene instead of silicon, we can make semiconductor components that are both cheaper and more effective than the ones currently on the market," explains Helge Weman of the Norwegian University of Science and Technology (NTNU). Dr Weman is behind the breakthrough discovery along with Professor Bjørn-Ove Fimland. "A material comprising a pliable base that is also transparent opens up a world of opportunities, one we have barely touched the surface of," says Dr Weman. "This may bring about a revolution in the production of solar cells and LED components. Windows in traditional houses could double as solar panels or a TV screen. Mobile phone screens could be wrapped around the wrist like a watch. In short, the potential is tremendous." The researchers will now begin to create prototypes directed towards specific areas of application. They have been in contact with giants in the electronics industry such as Samsung and IBM. "There is tremendous interest in producing semiconductors out of graphene, so it shouldn't be difficult to find collaborative partners," Dr Weman adds. The researchers are hoping to have the new semiconductor hybrid materials on the commercial market in roughly five years.